I love cute little gift tags and I don’t always want to make them from scratch. 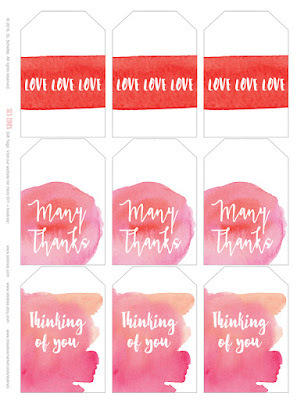 So I’ve made up a set of watercolor style gift tags for you to download and print from home! All you’ll need is some cardstock to print the file on as well as some pretty patterned paper (optional) to use as a backing and some twine or ribbon for the tags. The “how to” is simple! Just print your PDF onto some stable paper. I chose 110 lb cardstock and it worked perfectly. I glued some pretty patterned paper on the back of the printed tags (I used a glue stick for this). Once the papers are sealed together, cut out your tags. I used a slicer but scissors work well too. To create the hole for the ribbon, I used a three hole punch though you can purchase single hole punches of course. It figures that I couldn’t find mine when I needed it! Add some twine or ribbon and voila! Pretty watercolor gift tags. These watercolor shapes come from my Pink Watercolor Shapes Set. They’re in PNG format and can be used to make your own tags, cards and products! < Coloring Books & Christmas… in June. It happens. Super cute water color gift tags! Thanks a lot for sharing these photos here. We will be hosting a family party at local Chicago venues and it will be a great idea to use these watercolor tags on all return gifts. Thanks for the idea!